Internet Marketing firm AIMG announces the launch of a newly designed website for New York financial and tax specialists The Imperato Agency. In such a short amount of time, we are already ranking well in Google in target local areas. Internet Marketing and web development firm AIMG │ Accurate Imaging, Inc., recently launched a newly re-designed website for The Imperato Agency, a provider of tax, insurance, real estate, and legal services to business and personal clients throughout Long Island, New York City, Pennsylvania, New Jersey and Connecticut since 1965. In addition to strategy and design services, AIMG’s content development department provided the client with copywriting, digital image acquisition and preparation services. All sites developed by AIMG are search engine-friendly and the company offers professional search engine optimization and Internet marketing including Social Media as additional services. 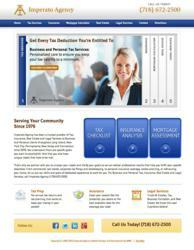 “We are very happy with the new site AIMG developed for us,” said Imperato. “In such a short amount of time, we are already ranking well in Google in target local areas. Additionally, the online checklists are making it easier for new, as well as old clients to submit the correct documents to us. Our website is now a legitimate business development tool." To learn more about The Imperato Agency, visit http://www.imperato.com or call 1-718-652-2500. For information about AIMG’ s marketing and web development services call 1-704-321-1234 or visit http://www.aimg.com. AIMG | Accurate Imaging is a full service internet marketing, web development and search engine optimization (seo) agency, with offices in New Jersey and North Carolina that serve clients in the United States, Canada and Europe. It offers website design, search engine optimization, custom application development, consulting for business development and marketing services. AIMG’s divisions include Enterprise Business Solutions, Small Business Marketing, Strategic Local Marketing, Industrial Sector Marketing, Medical Marketing, and its NOA Marketing Division specializing in the needs of non-profits, organizations and associations. Visit http://www.aimg.com or call 1-704-321-1234.